I give you two examples of plants and their power to live, no matter the circumstances. 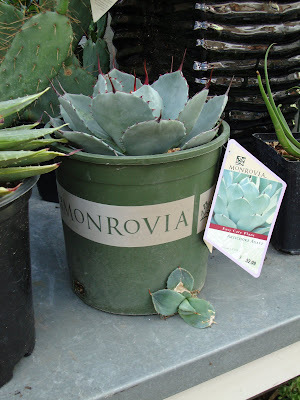 First an agave I spied at Garden Fever (yes ok, I go there FAR TOO OFTEN...is there anything wrong with that? ), I love it's determination and ability to push out the pup even though it's living within a tiny plastic pot. 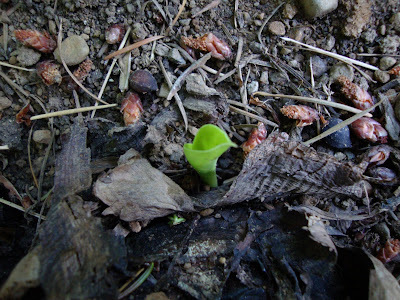 And secondly tonight I found a tiny sign of live on the mound of death that has been my Chinese Yellow Banana (Musella lasiocarpa). I really thought it was gone, but just on the chance that there was still a little life in there I had not dug it up, just planted a Tetrapanax in front of it to hide the death hole. Can this tiny little green leaf actually become a plant of any size? Only time will tell, but I'm willing to give it plenty of that, plus water and maybe even more fertilizer. Don't you just love that! I had a plant I was sure was on it's way to dead and now it's shooting out a bunch of new leaves. I think it's fine to go to Garden Fever and your other favorite nurseries several times a week. It's like visiting a museum or an art gallery. At least that's what I tell myself. And no matter how you slice it, it's way cheaper than therapy. Yes! Chinese yellow banana! Congratulations. I guess I should have held out hope for my red banana. Nice, nice. Love both pics! MTJ, I do love it! Our winter was bad but not bad enough to kill a plant hardy to 10 degrees, it just didn't figure. Patricia, thank you, I will quote you on these points. Megan, I think you were ok to call it DOA, the red banana is not terribly hardy where as the CYB should have been hardy to 10...there is no real reason for it to not live, which is what made it particularly upsetting. Karen, After Megan's post about her Colocasia I thought for sure I would find mine (same variety) showing life. Not so lucky...but I'll take the life in the CYB over that! So happy! I didn't buy the agave, I already have 3 of that variety...I was actually just there to get potting soil but you HAVE TO visit the plants too! !